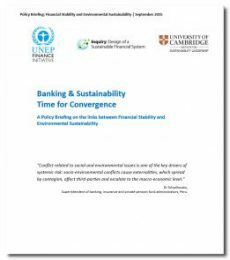 In 2014, the UNEP Finance Initiative (UNEP FI) and the University of Cambridge Institute for Sustainability Leadership (CISL, working with and on behalf of the Banking Environment Initiative – BEI) commissioned a study entitled, “Stability and Sustainability in Banking Reform – Are Environmental Risks Missing in Basel III?“. The study was conceived in recognition of the growing number of banking regulators around the world that have started to act on environmental and social issues, and aimed to assess the role that supranational banking regulation (i.e. Basel III) might play in this domain. The resulting report pointed to the material links between financial stability and environmental (and social) risks, which are already being experienced, and that are likely to become more pronounced and complex in the future. It offered several recommendations for supranational and national banking regulators accordingly. Since then, bilateral engagements with a number of banking regulators have taken place. In addition, an Expert Dialogue between the worlds of Science and Finance was convened jointly by UNEP FI, CISL and the UNEP Inquiry into the Design of a Sustainable Financial System (‘the UNEP Inquiry’) in April 2015, with a view to refining a common understanding of the stability-sustainability link and to exploring how this link might be addressed going forward. This briefing provides a synthesis of the current state of thinking on the topic, based on the work above. It is intended as a means of sharing key findings with policymakers and of engaging them on the matter. Comments are welcome and should be sent to: careen.abb@unep.org, nick.robins@unep.org and andrew.voysey@cisl.cam.ac.uk.